What’s Working with Health Content? Medical and healthcare information is some of the most personal information people search for online, and it presents a substantial opportunity for organizations in this field to provide relevant, credible, and useful health content for consumers to access when they need it. Because doctors have many years of schooling and are recognized experts, many people have a natural tendency to believe whatever doctors tells them. That belief extends to healthcare content on the Internet especially at sites of trusted professionals or organizations like doctor’s offices and health insurance companies. Therefore, it is critical that healthcare content, especially when it deals with diseases or medical conditions, be accurate and have transparent input and/or review by appropriate experts. Because people often seek healthcare content when under the stress of discovering that they or a loved one are suffering from a particular condition, it is important to treat healthcare and medical topics sensitively. Humor and a lighter tone are not unwelcome, but they should be limited to appropriate types of health content or discussions. The availability of medical information online is rarely something that will cause a customer to choose a particular company or healthcare provider. However, the lack of health and medical information may influence an existing customer’s decision to change affiliations. So what can marketers in the healthcare field do? Here are four examples of companies in healthcare or related fields that make health content available to their customers to highlight their value. For the most part, these companies do a good job of providing access to a large amount of information. 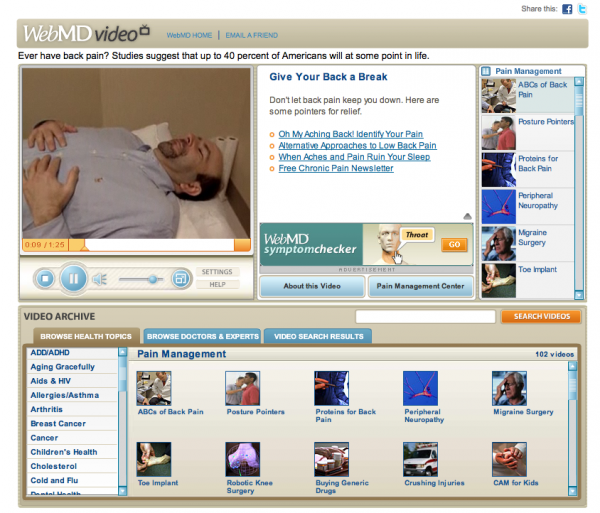 Designed as a web-based informational service to provide useful content to consumers, WebMD provides health content such as news, articles, community forums, and interactive research tools. If the site suffers any challenges, they are likely due to its comprehensive coverage of medical issues. The date of that review. In addition, articles and tools make good use of graphics, photographs, and videos, when applicable. User experience: Users have several ways to find any one piece of information, giving them choices for accessing content in ways that will be most comfortable for them. Powerful search function: Each page includes a top navigation bar with drop-down menus of subtopics. The left navigation bar is contextual — it changes based on what page a user is reading. Comprehensive topic browsing: To find information on a specific condition or disease, users can search a Health A-Z section, which lists topics alphabetically. A little bit like a site map, visitors can browse the entire list or narrow down their search by topic or format — Drugs A-Z, Living Better A-Z, Slideshows A-Z, etc. Available content: Users can access a tremendous amount of health content without registering. Users who do register receive access to special communities, a subscription to newsletters, and the print WebMD magazine, as well as access to tools for tracking health considerations like weight loss and vaccinations. There is even a Games A-Z section, featuring games that actually teach a little bit about health topics like overactive bladder (“Beat the Urge”, which you’ll enjoy if you play “Go”). Format/Layout: The overall format is clean and, though packed with a lot of information in each of the three columns, it is essentially uncluttered. 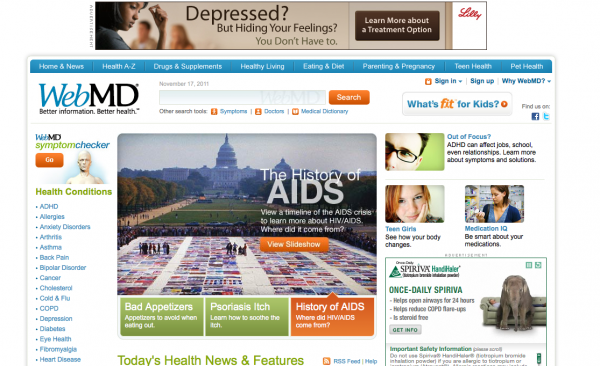 The center section of the home page is reserved for news, features, and links to the WebMD community and blogs on medical and health-related topics. The National Multiple Sclerosis (MS) Society’s website is designed to provide access to critical information on this disease for two distinct audiences: Consumers and professionals in the field. The foundation does a good job of making the division clear, and consumer information is written in suitably clear, easy-to-understand language. Content description: News coverage is offered on topics such as clinical trials, legislation, and the society itself, and the site also offers information on issues such as what MS is, how to live with the disease, and how to talk to children who may suffer from or be affected by it. In addition, the site features a multimedia library that is a useful repository of MS-related online magazines and newsletters (including Keep S’myelin, a newsletter for children), online videos, and other web resources. Available content: The PDF articles users can download include short author biographies. However, most of the online health content does not have author or source information, publication dates, or information about peer reviews. Each page has buttons to enable users to share the page on email or via social media sites such as Facebook, Twitter, and Delicious. Buttons allow registered users to bookmark content for future reference under My Content. 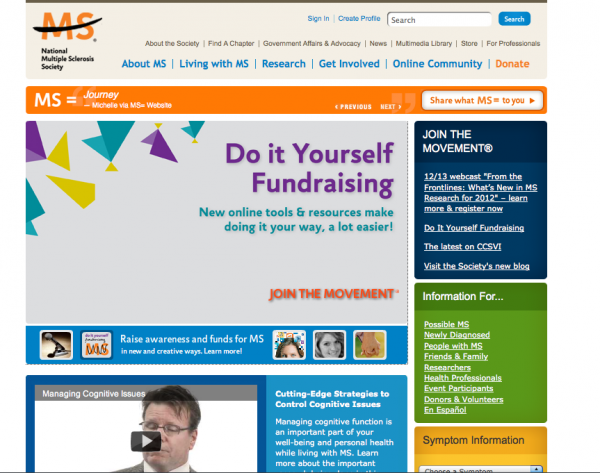 As far as navigation is concerned, the MS Society site could be more intuitive. There are two top navigation bars, including one at the very top that uses a small typeface. Presumably, this top level navigation bar is for information that is typically accessed less often. 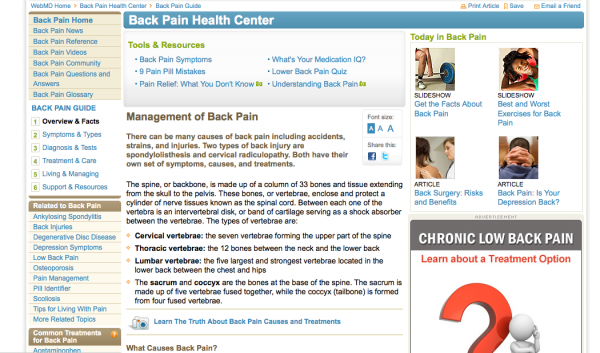 And the lower of the two top navigation bars provides the primary information that brings users to the site. Though all of the topics on both top navigation bars seem important. Social media: The society has a robust social media following, and the site’s Online Community page provides links to just what you’d expect — social media sites like Facebook and Twitter, but also to LinkedIn, YouTube, Flickr, and Second Life (from the Virtual Worlds link). The existence of a link to the Society’s MySpace page, which does not appear to have been updated in several months, is the only chink in the content/social media armor. As a health insurance company, United Healthcare provides health coverage for millions of Americans. It also provides plenty of health and wellness content on its website, though it can be easy to get lost in the maze of what it offers. Notably, three of these pages take you to separate URLs, with site designs that do not match that of the primary site and navigation structure. This lack of consistency in look, feel, and functionality could confuse or alienate the audience. “Be a Smart Patient,” for example, takes users to Mychoicenotchance.com, which contains health content like smart patient checklists and a preventative care tool, doesn’t have a clear navigation path back to the site. Users can also follow a link to search for a doctor, but this takes them to a different page (with a different interface) than if they selected “Find a Doctor” on the home page. 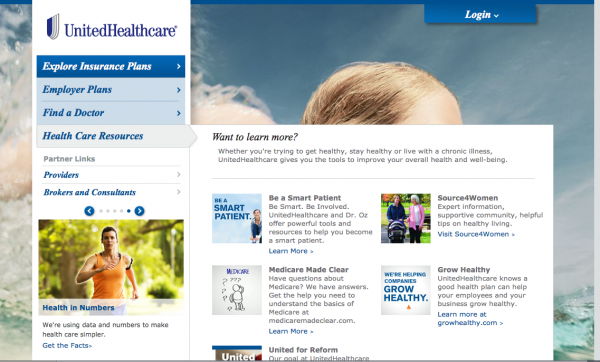 The resource sections, “Source4Women” and “United for Reform,” link to pages on the primary website of United Healthcare, using a top navigation bar that has a link to Health & Wellness. 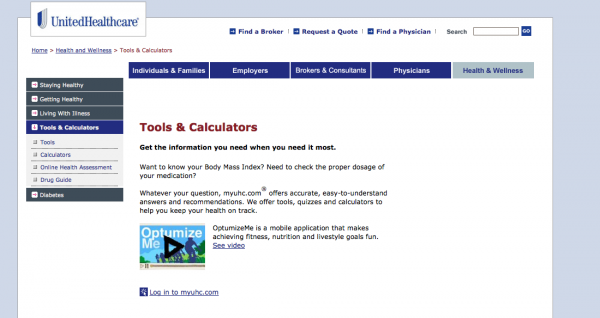 That link takes users to sections like “Getting Healthy, Staying Healthy” and “Tools & Calculators”. However, it appears that a lot of the health content connected to these categories is behind a firewall and can only be accessed by United Healthcare patients. Content description/Available content: Source4Women seems to have the most robust health content on the site in terms of amount and scope. 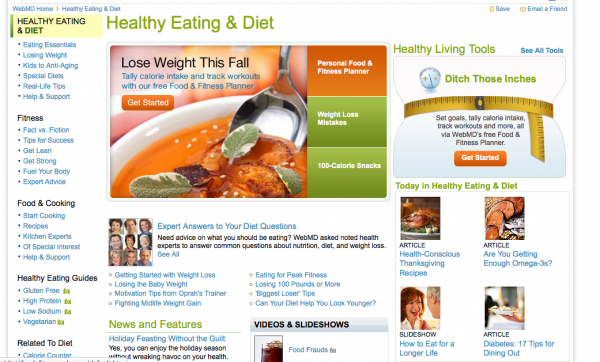 It includes recipes, health tips, and links to caregiver support resources, among other topics. This section seems to be where most of the health and wellness content is located; however, the section title might alienate the male audience and keep them from searching here, even though they can certainly benefit from the information and resources found here. Social media: Source4Women has a small Twitter presence (87 followers) and a community section, where users can find its expert blogs. United Healthcare itself does not appear to have a social media presence — no blogs, no identifiable Twitter handle, and no identifiable Facebook presence. 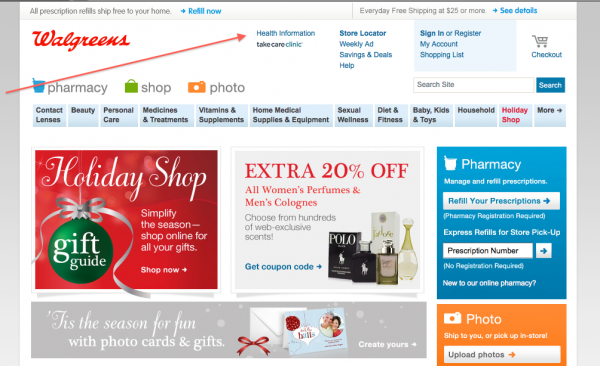 Serving as the online presence for major drugstore chain, Walgreens.com, is a multi-function e-commerce website. But customers and patients seeking more in-depth information can find it through a link (albeit in a very tiny font) to a healthcare portal on the center top of each page. “Health Topics” and “The Health Encyclopedia” enable users to drill down to particular topic they are interested in. “The Body Guide” provides an interactive directory to the human body, helping users learn about major body parts and systems. “Care Guides” provide step-by-step guidance for managing certain health conditions. 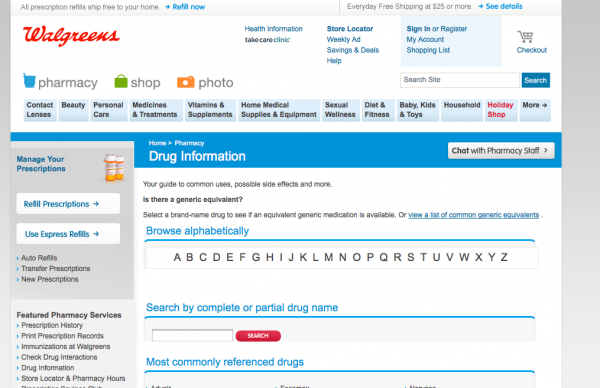 Content on Walgreens.com is created by medical doctors and other medical professionals. Articles contain authors or source references, the name of the doctor who reviewed the article, and the date of that review. User experience: Navigation is a bit jumbled on the site, and it can be confusing when searching for certain information. For example, there are dedicated links to Drug Information, a Pharmacist FAQ, and a Check Drug Interactions tool; however, these take users to the pharmacy site — where the Health Information navigation gets lost — which can leave a user confused as to how to return to the site. 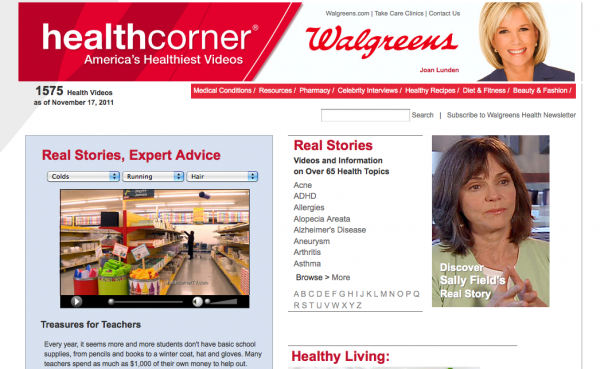 “Health Corner TV” and “Health Newsletters” links also take users to pages that are lacking the Walgreens site’s left navigation bar (Health Corner TV is a different URL). 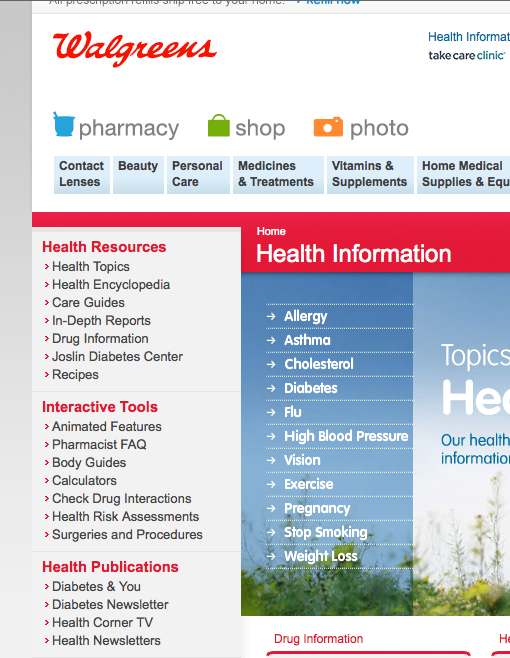 Social media: Shockingly, there are no direct links to Walgreens’ social media presence on the website’s home page or health information section, even though the company has a Facebook account with a large number of followers. The company has several Twitter accounts with between 1,000 and 54,000 followers on each, but it is not clear which is the corporate site or which may be individual Walgreen’s stores that have their own social presences. The company also has a YouTube channel with over 6,000 channel views, but users need to go directly through YouTube to find it. Links to these pages from the website would be useful in ensuring users are accessing the proper sites for more health content. Do you agree that this healthcare content is generally in good shape? Do you see the need for a cure? What sites do you think are the picture of healthy content?